MobCraft Beer has released a plethora of excellent beers, but back before I had even heard of them a group of friends in Chicago were going practically batshit over a new coffee beer out of a startup brewery in Wisconsin. At their urging I ran to the liquor store to pick up a bottle and was so impressed, I went back the next weekend and bought a case of Batshit Crazy. The beer has gone on to be a flagship beer from a brewery that otherwise releases one off-beers based upon user submitted recipes that then enter into a voting round. of hopping, giving them a less pronounced hop bitterness than a stout. You might be wondering why that matters, but what it really comes down to is that a brown ale should showcase the unique flavors of the coffee beans used more than a stout would, if equal amounts of coffee beans were used in both. For now though, let’s get on with the review. Brown ale brewed with milk sugar to add a balanced creamy sweetness, and flavored with a delicious blend of Guatemalen coffees that exhibit slight characteristics of cherry, tobacco and brown sugar. -We Use A 50/50 Blend Of Dark And Light Roasted Guatemalen Coffees From Just Coffee Coop But Feel Free To Get Creative! Batshit Crazy pours a brilliantly clear light mahogany with copper highlights when it is held up to the light. A moderately thick, light tan, creamy head that holds moderate retention (~3 min) before fading to a thin collar that leaves minimal lacing behind in the glass. A complex roast coffee leads in the aroma; it’s almost like walking into a neighborhood coffee shop, which I suppose kind of is the case here. Notes of caramel, leather and pipe tobacco provide additional depth and complexity. Coffee, tobacco and caramel linger round out the finish, and linger in the glass well past the last sip. The aroma is fricking amazing, and I found myself wishing this was in a mug so I could continue the illusion that I was drinking high end coffee. Roasted coffee leads in the in the flavor with moderate tobacco notes and a hint of caramel. There is a very slight coffee astringency, but it was less than my daily cup. Slight cherry notes, molasses, and a slight nuttiness blend effortlessly with the coffee. As the beer warms in the glass, the coffee notes deepen, and become more pronounced and the astringency fades. The finish is all molasses, tobacco, and coffee, with the coffee lingering long into the aftertaste. The moderate maltiness blends well with moderately low hop bitterness and a moderate level of bitterness from the coffee. With a medium body, and a moderately low level of carbonation, this is exceptionally smooth and easy drinking. 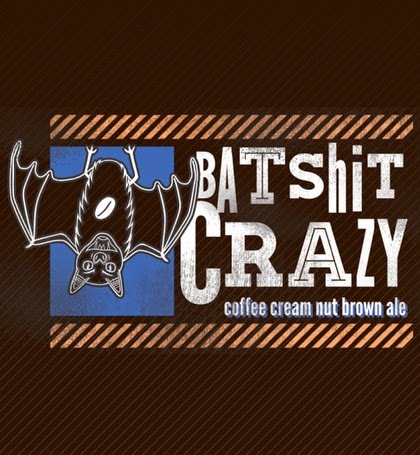 In case you couldn’t tell, I really like Batshit Crazy, and pick up a bottle whenever I see it. The only downside is that whenever I open a bottle I have to share at least half of it with my wife. This is an excellent coffee beer that really puts the emphasis on the coffee rather than the other ingredients, so it is very understandable that it medaled at the 2014 GABF. Fresh, this is one of my favorite beers on the market. There is one word to note in that last sentence though, “fresh”. Coffee beers can be hard, as Central Waters can attest with their twice recalled Peruvian Morning. After a couple months in the bottle Batshit Crazy can turn a little sour, taking on a lactic tartness, almost like plain yogurt. Coffee beers often seem to have a shorter shelf life, at least in my experience. So, if you stop by a liquor store, and see a bottle of Batshit on the self, pick up a couple, but by all means please drink it within a couple days of buying it. I know I will be picking up another bottle the next time it’s in stock! That’s all for today, remember to check back soon for another review!